For other uses, see Sievert (disambiguation). The sievert (symbol: Sv[note 1]) is a derived unit of ionizing radiation dose in the International System of Units (SI) and is a measure of the health effect of low levels of ionizing radiation on the human body. The sievert is of importance in dosimetry and radiation protection, and is named after Rolf Maximilian Sievert, a Swedish medical physicist renowned for work on radiation dose measurement and research into the biological effects of radiation. 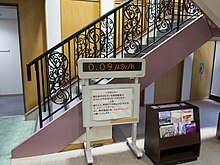 Display of background radiation in a hotel at Naraha, Japan, showing dose rate in microsieverts per hour, five years after the Fukushima disaster. The sievert is used for radiation dose quantities such as equivalent dose and effective dose, which represent the risk of external radiation from sources outside the body, and committed dose which represents the risk of internal irradiation due to inhaled or ingested radioactive substances. The sievert is intended to represent the stochastic health risk, which for radiation dose assessment is defined as the probability of radiation-induced cancer and genetic damage. One sievert carries with it a 5.5% chance of eventually developing cancer based on the linear no-threshold model. To enable consideration of stochastic health risk, calculations are performed to convert the physical quantity absorbed dose into equivalent dose and effective dose, the details of which depend on the radiation type and biological context. For applications in radiation protection and dosimetry assessment the International Commission on Radiological Protection (ICRP) and International Commission on Radiation Units and Measurements (ICRU) have published recommendations and data which are used to calculate these. These are under continual review, and changes are advised in the formal "Reports" of those bodies. Conventionally, the sievert is not used for high dose rates of radiation that produce deterministic effects, which is the severity of acute tissue damage that is certain to happen, such as acute radiation syndrome; these effects are compared to the physical quantity absorbed dose measured by the unit gray (Gy). One sievert equals 100 rem. The rem is an older, non-SI unit of measurement. "The quantity dose equivalent H is the product of the absorbed dose D of ionizing radiation and the dimensionless factor Q (quality factor) defined as a function of linear energy transfer by the ICRU"
The value of Q is not defined further by CIPM, but it requires the use of the relevant ICRU recommendations to provide this value. The CIPM also says that "in order to avoid any risk of confusion between the absorbed dose D and the dose equivalent H, the special names for the respective units should be used, that is, the name gray should be used instead of joules per kilogram for the unit of absorbed dose D and the name sievert instead of joules per kilogram for the unit of dose equivalent H". 1 Gy = 1 joule/kilogram – a physical quantity. 1 Gy is the deposit of a joule of radiation energy per kg of matter or tissue. 1 Sv = 1 joule/kilogram – a biological effect. The sievert represents the equivalent biological effect of the deposit of a joule of radiation energy in a kilogram of human tissue. The equivalence to absorbed dose is denoted by Q. "The sievert is the special name for the SI unit of equivalent dose, effective dose, and operational dose quantities. The unit is joule per kilogram." The sievert is used for a number of dose quantities which are described in this article and are part of the international radiological protection system devised and defined by the ICRP and ICRU. The ICRU/ICRP dose quantities have specific purposes and meanings, but some use common words in a different order. There can be confusion between, for instance, equivalent dose and dose equivalent. Although the CIPM definition states that the linear energy transfer function (Q) of the ICRU is used in calculating the biological effect, the ICRP in 1990 developed the "protection" dose quantities effective and equivalent dose which are calculated from more complex computational models and are distinguished by not having the phrase dose equivalent in their name. Only the operational dose quantities which still use Q for calculation retain the phrase dose equivalent. However, there are joint ICRU/ICRP proposals to simplify this system by changes to the operational dose definitions to harmonise with those of protection quantities. These were outlined at the 3rd International Symposium on Radiological Protection in October 2015, and if implemented would make the naming of operational quantities more logical by introducing "dose to lens of eye" and "dose to local skin" as equivalent doses. In the USA there are differently named dose quantities which are not part of the ICRP nomenclature. The sievert is used to represent the biological effects of different forms of external ionizing radiation on various types of human tissue. Some quantities cannot be practically measured, but they must be related to actual instrumentation and dosimetry measurements. The resultant complexity has required the creation of a number of different dose quantities within a coherent system developed by the ICRU working with the ICRP. The external dose quantities and their relationships are shown in the accompanying diagram. The ICRU is primarily responsible for the operational dose quantities, based upon the application of ionising radiation metrology, and the ICRP is primarily responsible for the protection quantities, based upon modelling of dose uptake and biological sensitivity of the human body. These are directly measurable physical quantities in which no allowance has been made for biological effects. Radiation fluence is the number of radiation particles impinging per unit area per unit time, kerma is the ionising effect of the radiation field, and absorbed dose is the amount of radiation energy deposited per unit mass. Protection quantities are calculated models, and are used as "limiting quantities" to specify exposure limits to ensure, in the words of ICRP, "that the occurrence of stochastic health effects is kept below unacceptable levels and that tissue reactions are avoided". These quantities cannot be measured in practice but their values are derived using models of external dose to internal organs of the human body, using anthropomorphic phantoms. These are 3D computational models of the body which take into account a number of complex effects such as body self-shielding and internal scattering of radiation. The calculation starts with organ absorbed dose, and then applies radiation and tissue weighting factors. As protection quantities cannot practically be measured, operational quantities must be used to relate them to practical radiation instrument and dosimeter responses. Operational quantities can be measured in practice, and are the means of measuring dose uptake due to exposure or predicting dose uptake in a measured environment, in relation to protection dose values. In this way they are used for practical dose control, by providing an estimate or upper limit for the value of the protection quantities related to an exposure. They are used in practical regulations and guidance. The calibration of individual and area dosemeters in photon fields is performed by measuring the collision "air kerma free in air" under conditions of secondary electron equilibrium. Then the appropriate operational quantity is derived applying a conversion coefficient that relates the air kerma to the appropriate operational quantity. The conversion coefficients for photon radiation are published by the ICRU. Simple (non-anthropomorphic) "phantoms" are used to relate operational quantities to measured free-air irradiation. The ICRU sphere phantom is based on the definition of an ICRU 4-element tissue-equivalent material which does not really exist and cannot be fabricated. The ICRU sphere is a theoretical 30 cm diameter "tissue equivalent" sphere consisting of a material with a density of 1 g·cm−3 and a mass composition of 76.2% oxygen, 11.1% carbon, 10.1% hydrogen and 2.6% nitrogen. This material is specified to most closely approximate human tissue in its absorption properties. According to the ICRP, the ICRU "sphere phantom" in most cases adequately approximates the human body as regards the scattering and attenuation of penetrating radiation fields under consideration. Thus radiation of a particular energy fluence will have roughly the same energy deposition within the sphere as it would in the equivalent mass of human tissue. To allow for back-scattering and absorption of the human body, the "slab phantom" is used to represent the human torso for practical calibration of whole body dosimeters. The slab phantom is 300 mm × 300 mm × 150 mm depth to represent the human torso. The joint ICRU/ICRP proposals outlined at the 3rd International Symposium on Radiological Protection in October 2015 to change the definition of operational quantities would not change the present use of calibration phantoms or reference radiation fields. This is an actual reading obtained from such as an ambient dose gamma monitor, or a personal dosimeter. Such instruments are calibrated using radiation metrology techniques which will trace them to a national radiation standard, and thereby relate them to an operational quantity. The readings of instruments and dosimeters are used to prevent the uptake of excessive dose and to provide records of dose uptake to satisfy radiation safety legislation; such as in the UK, the Ionising Radiations Regulations 1999. 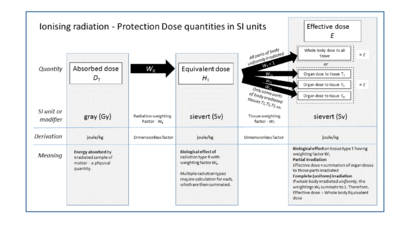 The sievert is used in external radiation protection for equivalent dose (the external-source, whole-body exposure effects, in a uniform field), and effective dose (which depends on the body parts irradiated). These dose quantities are weighted averages of absorbed dose designed to be representative of the stochastic health effects of radiation, and use of the sievert implies that appropriate weighting factors have been applied to the absorbed dose measurement or calculation (expressed in grays). The ICRP calculation provides two weighting factors to enable the calculation of protection quantities. 1. The radiation factor WR, which is specific for radiation type R – This is used in calculating the equivalent dose HT which can be for the whole body or for individual organs. 2. The tissue weighting factor WT, which is specific for tissue type T being irradiated. This is used with WR to calculate the contributory organ doses to arrive at an effective dose E for non-uniform irradiation. When a whole body is irradiated uniformly only the radiation weighting factor WR is used, and the effective dose equals the whole body equivalent dose. But if the irradiation of a body is partial or non-uniform the tissue factor WT is used to calculate dose to each organ or tissue. These are then summed to obtain the effective dose. In the case of uniform irradiation of the human body, these summate to 1, but in the case of partial or non-uniform irradiation, they will summate to a lower value depending on the organs concerned; reflecting the lower overall health effect. The calculation process is shown on the accompanying diagram. This approach calculates the biological risk contribution to the whole body, taking into account complete or partial irradiation, and the radiation type or types. The values of these weighting factors are conservatively chosen to be greater than the bulk of experimental values observed for the most sensitive cell types, based on averages of those obtained for the human population. Since different radiation types have different biological effects for the same deposited energy, a corrective radiation weighting factor WR, which is dependent on the radiation type and on the target tissue, is applied to convert the absorbed dose measured in the unit gray to determine the equivalent dose. The result is given the unit sievert. The equivalent dose is calculated by multiplying the absorbed energy, averaged by mass over an organ or tissue of interest, by a radiation weighting factor appropriate to the type and energy of radiation. To obtain the equivalent dose for a mix of radiation types and energies, a sum is taken over all types of radiation energy dose. Thus for example, an absorbed dose of 1 Gy by alpha particles will lead to an equivalent dose of 20 Sv. The radiation weighting factor for neutrons has been revised over time and remains controversial. This may seem to be a paradox. It implies that the energy of the incident radiation field in joules has increased by a factor of 20, thereby violating the laws of Conservation of energy. However, this is not the case. The sievert is used only to convey the fact that a gray of absorbed alpha particles would cause twenty times the biological effect of a gray of absorbed x-rays. It is this biological component that is being expressed when using sieverts rather than the actual energy delivered by the incident absorbed radiation. The second weighting factor is the tissue factor WT, but it is used only if there has been non-uniform irradiation of a body. If the body has been subject to uniform irradiation, the effective dose equals the whole body equivalent dose, and only the radiation weighting factor WR is used. But if there is partial or non-uniform body irradiation the calculation must take account of the individual organ doses received, because the sensitivity of each organ to irradiation depends on their tissue type. This summed dose from only those organs concerned gives the effective dose for the whole body. The tissue weighting factor is used to calculate those individual organ dose contributions. The ICRP values for WT are given in the table shown here. The article on effective dose gives the method of calculation. The absorbed dose is first corrected for the radiation type to give the equivalent dose, and then corrected for the tissue receiving the radiation. Some tissues like bone marrow are particularly sensitive to radiation, so they are given a weighting factor that is disproportionally large relative to the fraction of body mass they represent. Other tissues like the hard bone surface are particularly insensitive to radiation and are assigned a disproportionally low weighting factor. In summary, the sum of tissue-weighted doses to each irradiated organ or tissue of the body adds up to the effective dose for the body. The use of effective dose enables comparisons of overall dose received regardless of the extent of body irradiation. The operational quantities are used in practical applications for monitoring and investigating external exposure situations. They are defined for practical operational measurements and assessment of doses in the body. Three external operational dose quantities were devised to relate operational dosimeter and instrument measurements to the calculated protection quantities. Also devised were two phantoms, The ICRU "slab" and "sphere" phantoms which relate these quantities to incident radiation quantities using the Q(L) calculation. This is used for area monitoring of penetrating radiation and is usually expressed as the quantity H*(10). This means the radiation is equivalent to that found 10 mm within the ICRU sphere phantom in the direction of origin of the field. An example of penetrating radiation is gamma rays. This is used for monitoring of low penetrating radiation and is usually expressed as the quantity H'(0.07). This means the radiation is equivalent to that found at a depth of 0.07 mm in the ICRU sphere phantom. Examples of low penetrating radiation are alpha particles, beta particles and low-energy photons. This dose quantity is used for the determination of equivalent dose to such as the skin, lens of the eye. In radiological protection practice value of omega is usually not specified as the dose is usually at a maximum at the point of interest. This is used for individual dose monitoring, such as with a personal dosimeter worn on the body. The recommended depth for assessment is 10 mm which gives the quantity Hp(10). In order to simplify the means of calculating operational quantities, and assist in the comprehension of radiation dose protection quantities, ICRP Committee 2 & ICRU Report Committee 26 started in 2010 an examination of different means of achieving this by dose coefficients related to Effective Dose or Absorbed Dose. D = Φ × conversion coefficient for absorbed dose. The driver for this is the need to measure the deterministic effect, which it is suggested, is more appropriate than stochastic effect. This would calculate equivalent dose quantities Hlens and Hskin. This would remove the need for the ICRU Sphere and the Q-L function. Any changes would replace ICRU report 51, and part of report 57. A final draft report was issued in July 2017 by ICRU/ICRP for consultation. The sievert is used for human internal dose quantities in calculating committed dose. This is dose from radionuclides which have been ingested or inhaled into the human body, and thereby "committed" to irradiate the body for a period of time. The concepts of calculating protection quantities as described for external radiation applies, but as the source of radiation is within the tissue of the body, the calculation of absorbed organ dose uses different coefficients and irradiation mechanisms. The ICRP defines Committed effective dose, E(t) as the sum of the products of the committed organ or tissue equivalent doses and the appropriate tissue weighting factors WT, where t is the integration time in years following the intake. The commitment period is taken to be 50 years for adults, and to age 70 years for children. The ICRP further states "For internal exposure, committed effective doses are generally determined from an assessment of the intakes of radionuclides from bioassay measurements or other quantities (e.g., activity retained in the body or in daily excreta). The radiation dose is determined from the intake using recommended dose coefficients". A committed dose from an internal source is intended to carry the same effective risk as the same amount of equivalent dose applied uniformly to the whole body from an external source, or the same amount of effective dose applied to part of the body. Ionizing radiation has deterministic and stochastic effects on human health. Deterministic (acute tissue effect) events happen with certainty, with the resulting health conditions occurring in every individual who received the same high dose. Stochastic (cancer induction and genetic) events are inherently random, with most individuals in a group failing to ever exhibit any causal negative health effects after exposure, while an indeterministic random minority do, often with the resulting subtle negative health effects being observable only after large detailed epidemiology studies. The use of the sievert implies that only stochastic effects are being considered, and to avoid confusion deterministic effects are conventionally compared to values of absorbed dose expressed by the SI unit gray (Gy). Stochastic effects are those that occur randomly, such as radiation-induced cancer. The consensus of nuclear regulators, governments and the UNSCEAR is that the incidence of cancers due to ionizing radiation can be modeled as increasing linearly with effective dose at a rate of 5.5% per sievert. This is known as the Linear no-threshold model (LNT model). Some commentators such as the French Academy of Sciences (2005, Dose-effect relationships and...Tubiana, M. and Aurengo, A. Académie des Sciences & Académie Nationale de Médecine. (2005) www.researchgate.net/publication/277289357) and Oxford University (Wade Allison, 2015, Nuclear is for Life, pp79–80, ISBN 978-0-9562756-4-6) argue that this LNT model is now outdated and should be replaced with a threshold below which the body's natural cell processes repair damage and/or replace damaged cells. There is general agreement that the risk is much higher for infants and fetuses than adults, higher for the middle-aged than for seniors, and higher for women than for men, though there is no quantitative consensus about this. This is a graph depicting the effect of dose fractionation on the ability of gamma rays to cause cell death. The blue line is for cells which were not given a chance to recover; the radiation was delivered in one session, the red line is for cells which were allowed to stand for a time and recover. With the pause in delivery conferring radioresistance. The deterministic (acute tissue damage) effects that can lead to acute radiation syndrome only occur in the case of acute high doses (≳ 0.1 Gy) and high dose rates (≳ 0.1 Gy/h) and are conventionally not measured using the unit sievert, but use the unit gray (Gy). A model of deterministic risk would require different weighting factors (not yet established) than are used in the calculation of equivalent and effective dose. For occupational exposure, the limit is 50 mSv in a single year with a maximum of 100 mSv in a consecutive five-year period, and for the public to an average of 1 mSv (0.001 Sv) of effective dose per year, not including medical and occupational exposures. For comparison, natural radiation levels inside the US capitol building are such that a human body would receive an additional dose rate of 0.85 mSv/a, close to the regulatory limit, because of the uranium content of the granite structure. According to the conservative ICRP model, someone who spent 20 years inside the capitol building would have an extra one in a thousand chance of getting cancer, over and above any other existing risk (calculated as: 20 a·0.85 mSv/a·0.001 Sv/mSv·5.5%/Sv ≈ 0.1%). However, that "existing risk" is much higher; an average American would have a 10% chance of getting cancer during this same 20-year period, even without any exposure to artificial radiation (see natural Epidemiology of cancer and cancer rates). These estimates are, however, unmindful of every living cell's natural repair mechanisms, evolved over a few billion years of exposure to environmental chemical and radiation threats that were higher in the past, and exaggerated by the evolution of oxygen metabolism. USA Dept of Energy 2010 dose chart in sieverts for a variety of situations and applications. Various doses of radiation in sieverts, ranging from trivial to lethal, expressed as comparative areas. Comparison of radiation doses - includes the amount detected on the trip from Earth to Mars by the RAD on the MSL (2011–2013). Significant radiation doses are not frequently encountered in everyday life. The following examples can help illustrate relative magnitudes; these are meant to be examples only, not a comprehensive list of possible radiation doses. An "acute dose" is one that occurs over a short and finite period of time, while a "chronic dose" is a dose that continues for an extended period of time so that it is better described by a dose rate. 10 to 17 Sv: fatal acute doses during Tokaimura nuclear accident. Hisashi Ouchi who received 17 Sv was kept alive for 83 days after the accident. 36 Sv: fatal acute dose to Cecil Kelley in 1958, death occurred within 35 hours. All conversions between hours and years have assumed continuous presence in a steady field, disregarding known fluctuations, intermittent exposure and radioactive decay. Converted values are shown in parentheses. <1 mSv/a <100 nSv/h Steady dose rates below 100 nSv/h are difficult to measure. 1 mSv/a (100 nSv/h avg) ICRP recommended maximum for external irradiation of the human body, excluding medical and occupational exposures. (800 mSv/a) 90 μSv/h Natural radiation on a monazite beach near Guarapari, Brazil. 2–20 mSv/h Typical dose rate for activated reactor wall in possible future fusion reactors after 100 years. After approximately 300 years of decay the fusion waste would produce the same dose rate as exposure to coal ash, with the volume of fusion waste naturally being orders of magnitude less than from coal ash. Immediate predicted activation is 90 MGy/a. (4.6–5.6 MSv/a) 530–650 Sv/h The radiation level inside the primary containment vessel of the second BWR-reactor of the Fukushima power station, as of February 2017, six years after a suspected meltdown. In this environment, it takes between 22 to 34 seconds to accumulate a median lethal dose (LD50/30). ^ a b c d Noted figures are dominated by a committed dose which gradually turned into effective dose over an extended period of time. Therefore the true acute dose must be lower, but standard dosimetry practice is to account committed doses as acute in the year the radioisotopes are taken into the body. ^ The dose rate received by air crews is highly dependent on the radiation weighting factors chosen for protons and neutrons, which have changed over time and remain controversial. ^ a b Noted figures exclude any committed dose from radioisotopes taken into the body. Therefore the total radiation dose would be higher unless respiratory protection was used. The sievert has its origin in the röntgen equivalent man (rem) which was derived from CGS units. 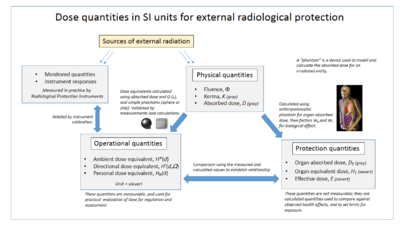 The International Commission on Radiation Units and Measurements (ICRU) promoted a switch to coherent SI units in the 1970s, and announced in 1976 that it planned to formulate a suitable unit for equivalent dose. The ICRP pre-empted the ICRU by introducing the sievert in 1977. The sievert was adopted by the International Committee for Weights and Measures (CIPM) in 1980, five years after adopting the gray. The CIPM then issued an explanation in 1984, recommending when the sievert should be used as opposed to the gray. That explanation was updated in 2002 to bring it closer to the ICRP's definition of equivalent dose, which had changed in 1990. Specifically, the ICRP had introduced equivalent dose, renamed the quality factor (Q) to radiation weighting factor (WR), and dropped another weighting factor 'N' in 1990. In 2002, the CIPM similarly dropped the weighting factor 'N' from their explanation but otherwise kept other old terminology and symbols. This explanation only appears in the appendix to the SI brochure and is not part of the definition of the sievert. This SI unit is named after Rolf Maximilian Sievert. As with every International System of Units (SI) unit named for a person, the first letter of its symbol is upper case (Sv). However, when an SI unit is spelled out in English, it is treated as a common noun and should always begin with a lower case letter (sievert)—except in a situation where any word in that position would be capitalized, such as at the beginning of a sentence or in material using title case. Although the United States Nuclear Regulatory Commission permits the use of the units curie, rad, and rem alongside SI units, the European Union European units of measurement directives required that their use for "public health ... purposes" be phased out by 31 December 1985. ^ Not be confused with the sverdrup or the svedberg, two non-SI units that sometimes use the same symbol. ^ a b c d e f g Icrp (2007). "The 2007 Recommendations of the International Commission on Radiological Protection". Annals of the ICRP. ICRP publication 103. 37 (2–4). ISBN 978-0-7020-3048-2. Retrieved 17 May 2012. ^ a b c ICRP publication 103 - Glossary. ^ "The confusing world of radiation dosimetry" - M.A. Boyd, U.S. Environmental Protection Agency 2009. An account of chronological differences between US and ICRP dosimetry systems. ^ Icrp (1991). "1990 Recommendations of the International Commission on Radiological Protection". Annals of the ICRP. ICRP publication 60. 21 (1–3). ISBN 978-0-08-041144-6. Retrieved 17 May 2012. ^ ICRP draft "Operational Quantities for External Radiation Exposure"
^ ICRP publication 103 - Paragraph 144. ^ Peck, Donald J.; Samei, Ehsan. "How to Understand and Communicate Radiation Risk". Image Wisely. Archived from the original on 8 December 2010. Retrieved 18 May 2012. ^ United Nations Scientific Committee on the Effects of Atomic Radiation (2008). Effects of ionizing radiation: UNSCEAR 2006 report to the General Assembly, with scientific annexes. New York: United Nations. ISBN 978-92-1-142263-4. Retrieved 18 May 2012. ^ ICRP. "Report 103": Table 8, section 6.5. ^ Formerly Utilized Sites Remedial Action Program. "Radiation in the Environment" (PDF). US Army Corps of Engineers. Archived from the original (PDF) on 11 February 2012. Retrieved 18 May 2012. ^ "Ionizing Radiation Dose Ranges (Rem and Sievert charts)" (PDF). US Department of Energy. June 2010. Retrieved 2018-05-28. ^ a b Kerr, R. A. (31 May 2013). "Radiation Will Make Astronauts' Trip to Mars Even Riskier". Science. 340 (6136): 1031. doi:10.1126/science.340.6136.1031. ISSN 0036-8075. PMID 23723213. ^ Zeitlin, C.; et al. (31 May 2013). "Measurements of Energetic Particle Radiation in Transit to Mars on the Mars Science Laboratory". Science. 340 (6136): 1080–1084. Bibcode:2013Sci...340.1080Z. doi:10.1126/science.1235989. ISSN 0036-8075. PMID 23723233. ^ Chang, Kenneth (30 May 2013). "Data Point to Radiation Risk for Travelers to Mars". New York Times. Retrieved 31 May 2013. ^ Gelling, Cristy (June 29, 2013). "Mars trip would deliver big radiation dose; Curiosity instrument confirms expectation of major exposures". Science News. 183 (13): 8. doi:10.1002/scin.5591831304. Retrieved July 8, 2013. ^ RadSafe mailing list: original posting and follow up thread. FGR11 discussed. ^ American National Standards Institute (2009). Radiation Safety for Personnel Security Screening Systems Using X‐Rays or Gamma Radiation (PDF). ANSI/HPS N43.17. Retrieved 31 May 2012. ^ Hart, D.; Wall, B. F. (2002). Radiation Exposure of the UK Population from Medical and Dental X-ray Examinations (PDF). National Radiological Protection Board. p. 9. ISBN 0 85951 468 4. Retrieved 18 May 2012. ^ "What Happened and What Didn't in the TMI-2 Accident". American Nuclear Society. Archived from the original on 30 October 2004. Retrieved 28 December 2018. ^ Hendrick, R. Edward (October 2010). "Radiation Doses and Cancer Risks from Breast Imaging Studies". Radiology. 257 (1): 246–253. doi:10.1148/radiol.10100570. PMID 20736332. Retrieved 18 May 2012. ^ "NRC: 10 CFR 20.1301 Dose limits for individual members of the public". NRC. Retrieved 2014-02-07. ^ Grajewski, Barbara; Waters, Martha A.; Whelan, Elizabeth A.; Bloom, Thomas F. (2002). "Radiation dose estimation for epidemiologic studies of flight attendants" (PDF). American Journal of Industrial Medicine. 41 (1): 27–37. doi:10.1002/ajim.10018. ISSN 0271-3586. PMID 11757053. ^ Brenner, David J.; Hall, Eric J. (2007). "Computed Tomography — an Increasing Source of Radiation Exposure". New England Journal of Medicine. 357 (22): 2277–2284. doi:10.1056/NEJMra072149. PMID 18046031. ^ a b "NRC: 10 CFR 20.1201 Occupational dose limits for adults". NRC. Retrieved 2014-02-07. ^ Hosoda, Masahiro; Tokonami, Shinji; Sorimachi, Atsuyuki; Monzen, Satoru; Osanai, Minoru; Yamada, Masatoshi; Kashiwakura, Ikuo; Akiba, Suminori (2011). "The time variation of dose rate artificially increased by the Fukushima nuclear crisis". Scientific Reports. 1: 87. Bibcode:2011NatSR...1E..87H. doi:10.1038/srep00087. PMC 3216573. PMID 22355606. Retrieved 19 May 2012. ^ "F. Typical Sources of Radiation Exposure". web.archive.org. 2013-06-13. Retrieved 2019-04-15. 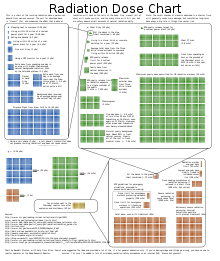 ^ "Radiation Risk for Xray and CT exams - dosage chart". web.archive.org. 2012-04-26. Retrieved 2019-04-15. ^ American Nuclear Society (March 2012). "Appendix B" (PDF). In Klein, Dale; Corradini, Michael. Fukushima Daiichi: ANS Committee Report. Retrieved 19 May 2012. ^ "Lethal dose (LD)". www.nrc.gov. Retrieved 2017-02-12. ^ a b McLaughlin, Thomas P.; Monahan, Shean P.; Pruvost, Norman L.; Frolov, Vladimir V.; Ryazanov, Boris G.; Sviridov, Victor I. (May 2000). A Review of Criticality Accidents (PDF). Los Alamos, NM: Los Alamos National Laboratory. pp. 74–75. LA-13638. Retrieved 21 April 2010. ^ "JCO worker succumbs after 83 days". Retrieved 24 April 2016. ^ "The Cecil Kelley Criticality Accident: The Origin of the Los Alamos Human Tissue Analysis Program" (PDF). Los Alamos Science. 23: 250–251. 1995. ^ Dolgodvorov, Vladimir (November 2002). "K-19, the Forgotten Sub" (in Russian). trud.ru. Retrieved 2 July 2015. ^ Moss, William; Eckhardt, Roger (1995). "The Human Plutonium Injection Experiments" (PDF). Los Alamos Science. Radiation Protection and the Human Radiation Experiments (23): 177–223. Retrieved 13 November 2012. ^ Bailey, Susan (January 2000). "Air crew radiation exposure—An overview" (PDF). Nuclear News. Retrieved 19 May 2012. ^ Hendry, Jolyon H.; Simon, Steven L.; Wojcik, Andrzej; Sohrabi, Mehdi; Burkart, Werner; Cardis, Elisabeth; Laurier, Dominique; Tirmarche, Margot; Hayata, Isamu (1 June 2009). "Human exposure to high natural background radiation: what can it teach us about radiation risks?" (PDF). Journal of Radiological Protection. 29 (2A): A29–A42. Bibcode:2009JRP....29...29H. doi:10.1088/0952-4746/29/2A/S03. PMC 4030667. PMID 19454802. Archived from the original (PDF) on 21 October 2013. Retrieved 1 December 2012. ^ United Nations Scientific Committee on the Effects of Atomic Radiation (2000). "Annex B". 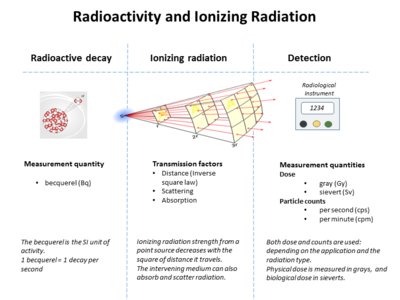 Sources and Effects of Ionizing Radiation. vol. 1. United Nations. p. 121. Retrieved 11 November 2012. ^ US Nuclear Regulatory Commission (2006). Regulatory Guide 8.38: Control of Access to High and Very High Radiation Areas in Nuclear Power Plants (PDF). ^ Energy Markets: The Challenges of the New Millennium, 18th World Energy Congress, Buenos Aires, Argentina, 21–25 October 2001, Figure X page 13. ^ Di Pace, Luigi; El-Guebaly, Laila; Kolbasov, Boris; Massaut, Vincent; Zucchetti, Massimo (2012). "Ch. 14: Radioactive Waste Management of Fusion Power Plants" (PDF). In Rehab Abdel Rahman. Radioactive Waste. InTech. p. 318. ISBN 978-953-51-0551-0. Retrieved 19 May 2012. ^ Widner, Thomas (June 2009). Draft Final Report of the Los Alamos Historical Document Retrieval and Assessment (LAHDRA) Project (PDF). Centers for Disease Control and Prevention. Retrieved 12 November 2012. ^ Su, S. (August 2006). TAD Source Term and Dose Rate Evaluation (PDF). Bechtel Saic. 000-30R-GGDE-00100-000-00A. Retrieved 20 May 2012. ^ "High radiation readings at Fukushima's No. 2 reactor complicate robot-based probe". www.japantimes.co.jp. ^ "Fukushima nuclear reactor radiation at highest level since 2011 meltdown". ^ "Fukushima's Reactor #2 is far more radioactive than previously realized". ^ "Excessive Radiation Inside Fukushima Fries Clean-up Robot". gizmodo.com. ^ "Japanese nuclear plant just recorded an astronomical radiation level. Should we be worried?". www.washingtonpost.com. Retrieved 2017-09-09. ^ Wyckoff, H. O. (April 1977). Round table on SI units: ICRU Activities (PDF). International Congress of the International Radiation Protection Association. Paris, France. Retrieved 18 May 2012. ^ Wyckoff, H. O.; Allisy, A.; Lidén, K. (May 1976). "The New Special Names of SI Units in the Field of Ionizing Radiations" (PDF). British Journal of Radiology. 49 (581): 476–477. doi:10.1259/0007-1285-49-581-476-b. ISSN 1748-880X. PMID 949584. Retrieved 18 May 2012. ^ "Recommendations of the ICRP". Annals of the ICRP. ICRP publication 26. 1 (3). 1977. Retrieved 17 May 2012. ^ Recommendations of the International Commission on Radiological Protection and of the International Commission on Radiological Units (PDF). National Bureau of Standards Handbook. 47. US Department of Commerce. 1950. Retrieved 14 November 2012. ^ 10 CFR 20.1004. US Nuclear Regulatory Commission. 2009. ^ The Council of the European Communities (1979-12-21). "Council Directive 80/181/EEC of 20 December 1979 on the approximation of the laws of the Member States relating to Unit of measurement and on the repeal of Directive 71/354/EEC". Retrieved 19 May 2012. ^ Office of Air and Radiation; Office of Radiation and Indoor Air (May 2007). "Radiation: Risks and Realities" (PDF). U.S. Environmental Protection Agency. p. 2. Retrieved 19 March 2011. Glover, Paul. "Millisieverts and Radiation". Sixty Symbols. Brady Haran for the University of Nottingham.